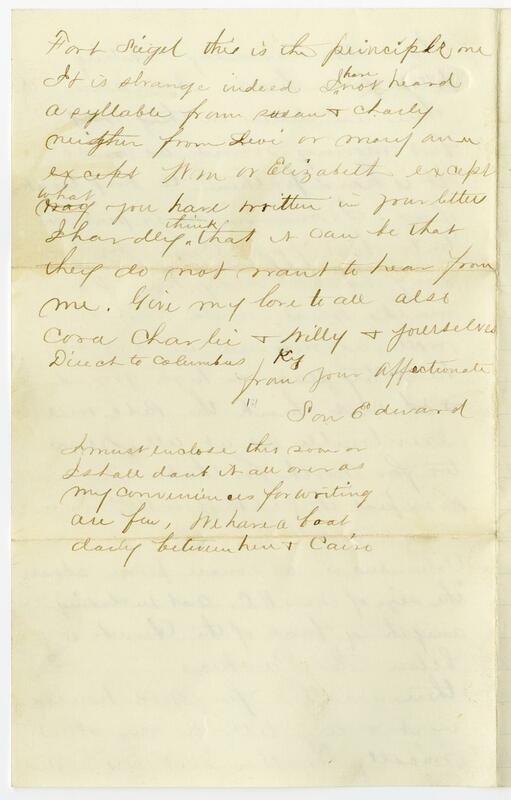 Item description: Letter, 16 April 1864, from Edward W. Allen to his parents.Edward W. Allen of Eau Claire, Wis., was a sergeant and then second lieutenant in Company H of the 16th Regiment, Wisconsin Infantry Volunteers, during the Civil War. He was the son of James and Emily Allen. He had several siblings, including James F. (Fred) Allen who served in Company K, 36th Regiment of Wisconsin Volunteers. 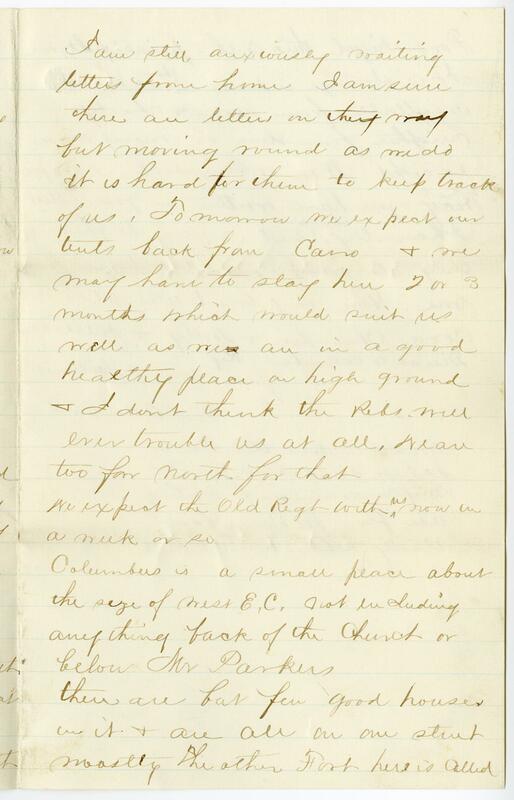 The letter mentions the Union soldiers’ strong position near Fort Halleck in Columbus, Kentucky, and includes a description of African Americans in the 3rd U.S. Heavy Artillery and their reaction to the Fort Pillow Massacre. Item citation: From folder 1 of the Edward W. Allen Papers (#3737-z), Southern Historical Collection, Wilson Library, University of North Carolina at Chapel Hill. Two days more & still no enemy. Anxiously we have watched & waited but they won’t come. We feel entirely safe against 10 times our number so strong is the position we hold. Yesterday the garrison was on fatigue a part of the day filling sacks with sand to lay on top of the fort to protect the men & gunners from the enemy’s sharp shooters. Also in burning buildings between the guns of the fort & the woods back of it. A part of a New Jersey Regt. that were camped out side the Fort moved in & today their quarters are being pulled down. This is done to prevent the enemy’s sharpshooters from secreting them selves & picking of the gunners. All the big guns in Fort are worked by negroes & belong to the 3rd U.S. Heavy Artillery. They have heard of the massacre at Fort Pillow & are terribly incensed at the rebels & will, no doubt, fight till death, for they know the consequences if taken alive. Today Tinker (Lt.), orderly of Co. G. & myself went down to the city & had a good cup of coffee with milk & sugar bread & butter & cake, something I have not had since leaving Madison. I bought a pound of butter 40 cents only. Tell Mary Ann I think almost daily of her turkies (Christmas) but if I had one here I should hardly dare eat it for fear of the diarrhea. When northern men come south, it’s a long time before they can eat meat right hearty. 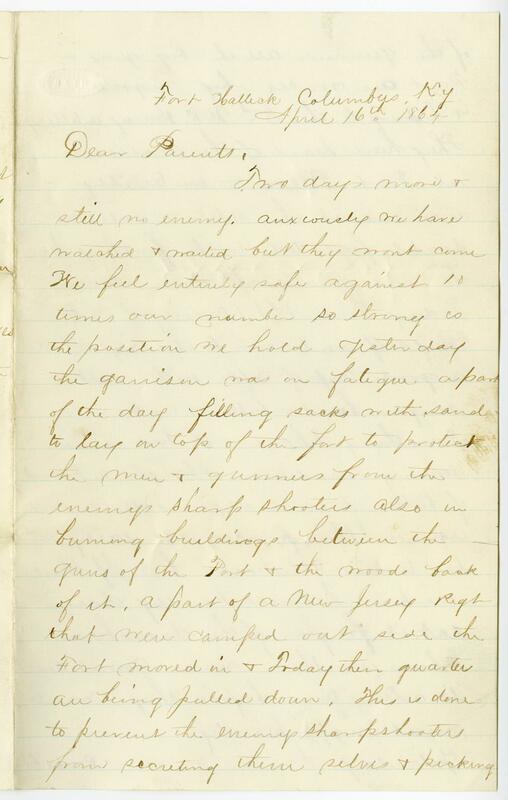 Yesterday I wrote to Miss Roworth I am still anxiously waiting letters from home. I am sure there are letters on their way but moving round as we do it is hard for them to keep track of us. Tomorrow we expect our tents back from Cairo & we may have to stay here 2 or 3 months which would suit us well as we are in a good healthy peace on high ground & I don’t think the Rebs will ever trouble us at all. We are too far north for that. We expect the Old Regt. with us now in a week or so. Columbus is a small peace about the size of west E.C. not including anything back of the Church or below Mr. Parkers’. There are but few good houses in it & are all on one street mostly the other Fort here is called Fort Siegel. This is the principle one. It is strange indeed I have not heard a syllable from Susan & Charly neither from Levi or Mary Ann. Wm. or Elizabeth except what you have written in four letters. I hardly think that it can be that they do not want to hear from me. Give my love to all also [C?] Charlie & Willy & yourselves. Direct to Columbus, Ky. I must enclose this soon or I shall [daub?] it all over as my conveniences for writing are few, we have a boat daily between here & Cairo. 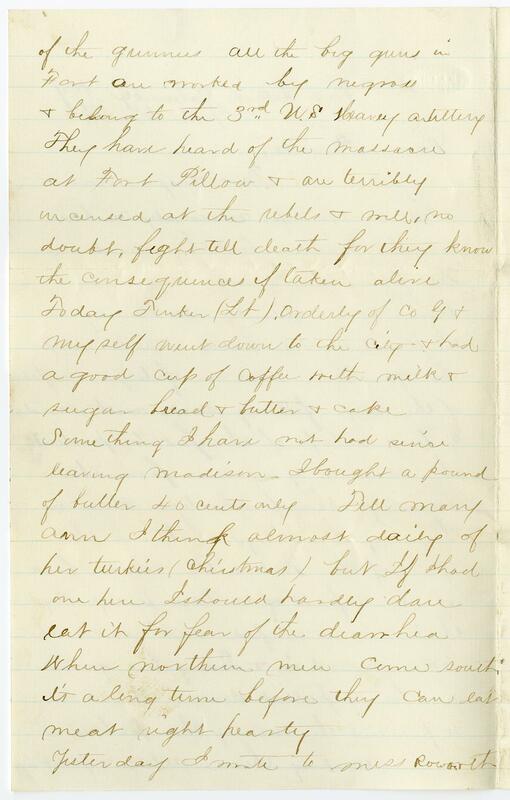 This entry was posted in Southern Historical Collection and tagged 16th Wisconsin Infantry Regiment, African American soldiers, Columbus, Edward W. Allen, Fort Halleck, Fort Pillow Massacre, Kentucky, Wisconsin. Bookmark the permalink.